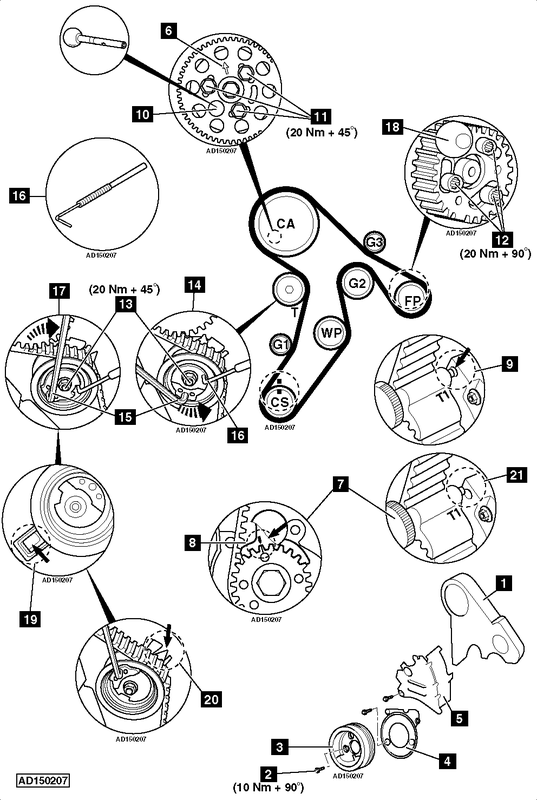 Volkswagen recommend replacement every 140,000 miles (tensioner pulley must also be replaced). Camshaft sprocket/high-pressure fuel pump sprocket holding tool – Nos.T10172/4. Camshaft/high-pressure fuel pump locking tool – No.3359. Crankshaft sprocket locking tool – No.T10050. Tensioner pulley adjusting tool – No.T10264. Tensioner pulley locking tool – No.T10265. Golf/Estate/Plus/Passat/Touran: Windscreen washer reservoir filler neck. Disconnect diesel particulate filter (DPF) pressure sensor multi-plug. Remove diesel particulate filter (DPF) pressure sensor bracket. Jetta/Polo: Fuel supply and return pipes. Golf/Estate/Plus/Passat/Touran: Fuel filter housing. DO NOT disconnect hoses. Disconnect coolant level sensor multi-plug. Disconnect engine coolant temperature (ECT) sensor multi-plug. Golf/Estate/Plus/Passat/Touran: Detach coolant pipe support bracket from engine mounting bracket. DO NOT disconnect hoses. Ensure arrow on camshaft sprocket at approximately 12 o’clock position  . Lock crankshaft sprocket  . Use tool No.T10050. Ensure lug of crankshaft sprocket locking tool located in oil seal housing  . Lock camshaft  . Use tool No.3359. Slacken high-pressure fuel pump sprocket bolts  . Use tool No.T10385.NOTE: Slacken bolts until sprockets can be moved within slotted holes. Turn tensioner pulley anti-clockwise until locking tool can be inserted  . Use tool No.T10264  . Insert locking tool in tensioner pulley  . Tool No.T10265. Turn tensioner pulley fully clockwise until it reaches stop  . Use tool No.T10264  . Remove timing belt, starting at guide pulley (G3). Slacken tensioner pulley nut  . Remove tensioner pulley.NOTE: Mark direction of rotation on belt with chalk if belt is to be reused. Fit new camshaft sprocket bolts  . Tighten bolts finger tight. Fit new high-pressure fuel pump sprocket bolts  . Tighten bolts finger tight.NOTE: Sprockets should turn freely but not tilt. Lock high-pressure fuel pump  . Use tool No.3359. Turn high-pressure fuel pump sprocket fully clockwise in slotted holes. Remove locking tool from tensioner pulley  . Ensure tensioner pulley retaining lug is properly engaged  . Turn tensioner pulley slowly clockwise until pointer aligned with notch  . Ensure tensioner pulley nut does not turn  . Hold tensioner pulley. Use tool No.T10264  . Turn camshaft sprocket anti-clockwise to remove slack from belt between camshaft sprocket and high-pressure fuel pump sprocket. Use tool Nos.T10172/4. Tighten camshaft sprocket and high-pressure fuel pump sprocket bolts  &  . Tightening torque: 20 Nm. Fit crankshaft sprocket locking tool while slowly turning crankshaft to TDC  . Ensure camshaft locking tool can be inserted easily  .NOTE: DO NOT insert high-pressure fuel pump locking tool as alignment hole may be slightly misaligned. No adjustment required. Ensure tensioner pulley pointer aligned with notch or 5 mm maximum to the right of notch  . If not: Repeat tensioning procedure. Turn crankshaft clockwise until camshaft locking tool can be inserted  . Slacken camshaft sprocket bolts  .NOTE: Lug of crankshaft sprocket locking tool will be positioned to the left or right of hole in oil seal housing. Turn crankshaft clockwise until lug and hole aligned  . Hold camshaft sprocket. Use tool Nos.T10172/4. Ensure camshaft locking tool can be inserted easily  . Tighten camshaft sprocket bolts  . Tightening torque: 20 Nm + 45°. Hold high-pressure fuel pump sprocket. Use tool Nos.T10172/4. Tighten high-pressure fuel pump sprocket bolts  . Tightening torque: 20 Nm + 90°.